Where would you go if you wanted to buy products made from recycled materials for your home, your business or your community? Actually, not far. Steel products like lawn mowers, fences, stop signs, refrigerators, tool boxes, swing sets, utensils and even pick-up trucks are all made from recycled steel. Steel is the supermetal of metals: it is the world’s most useful, least expensive and most recycled metal. And there’s no need to hunt for a special recycling sticker or symbol on steel products - from baby spoons to bridge beams-all steel items contain recycled steel, or what many refer to as recycled content. That’s because millions of tons of steel scrap are recovered from industry and also diverted from the solid waste stream and recycled each year. Steel doesn’t experience end market hibernation, when end markets gorge themselves on recyclables for a short time before steeling in for a long period of inactivity. Instead, steel mills are the epitome of solid, stable end markets. The steel industry’s appetite for scrap was particularly healthy in 995, with more than 70 million tons of scrap recycled. 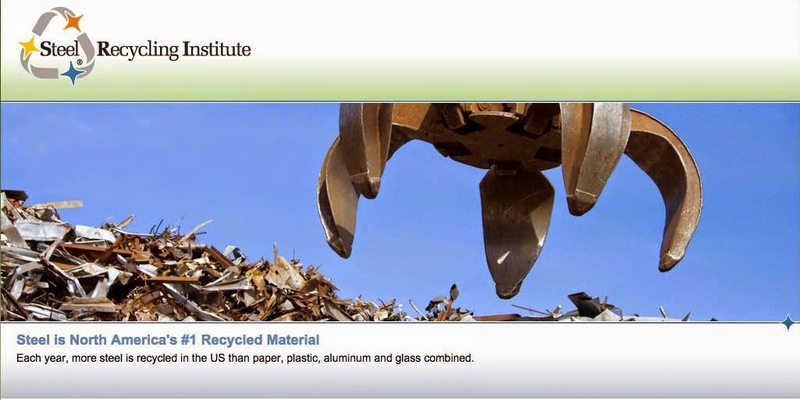 All this scrap consumption loosened the industry’s recycling belt a few notches outward to 68.5 percent, its highest rate since the Steel Recycling Institute (SRI) began calculating it in 1988. The reason steel mills are such stable end markets is that steel simply isn’t made without recycling scrap. Steelmakers learned long ago that remnants of steel could be used as a feedstock for the furnace. Recycling wasn’t motivated by our current environmental concerns but instead by very real economic ones. Nonetheless, the steel industry’s drive for an efficient, cost-effective method of steelmaking resulted in environmental benefits. Through recycling, the expenses of mining new iron ore, coal and other raw materials, as well as transporting and refining these materials into a usable form, are avoided-and as a result, natural resources are conserved. Fe + C = ? On a most basic level, steel is formed when the element iron (symbol Fe) is combined with a small amount of the element carbon (symbol C). The addition of carbon makes the iron stronger and harder. Today, there are two ways to make steel in the United States, both of which use extensive amounts of steel scrap. One of the two methods is through a basic oxygen furnace (BOF). The other is through the electric arc furnace (EAF). In the United, more steel is produced in the BOF than in the EAF. As much as 300 tons of steel can be produced in a single BOF in as little as 45 minutes. The BOF recycles approximately 28 percent steel scrap in the production of new steel. This steel scrap includes a variety of post-consumer products, such as steel cans, appliances, automobiles and construction and demolition material. First, steelmakers select specific types and amounts of steel scrap, like bales of steel cans, and load the scrap into a scrap charging hopper. The charging hopper is then positioned before the BOF opening, and the steel scrap is dumped (or what steelmakers refer to as charged) into the furnace. After the scrap charging hopper is moved away from the furnace opening, hot molten iron is then poured into the furnace on top of the scrap. Onto this molten metal bath is blown high purity oxygen. Within 45 minutes, the metal bath is transformed into molten steel. The steel produced in the BOF is typically used to make steel sheet products, such as steel cans, cars and appliances. The electric arc furnace uses virtually 100 percent steel scrap to produce new steel. During the steelmaking process, the roof of the furnace is swung aside so that the scrap may be charged inside. The roof is then replaced, and carbon electrodes are lowered through openings in the roof. Electric arcs produce enough heat to melt the steel scrap. The issue of recycled content is different for steel than it is for products like paper and plastic. For example, steel with virtually 100 percent recycled content is not environmentally superior, so to speak, to steel with 28 percent recycled content. This is not contradictory because they are both complementary parts of the total interlocking infrastructure of steel making, product manufacture, scrap generation and recycling. The recycled content of EAF steel relies on the embodied energy savings of the steel created in the BOF. There are some basic reasons for this. Consider that steel products are largely durable goods: cars, appliances, bridges and buildings remain in use for many years. All new steel cannot be made with the EAF because the supply of available quality steel scrap for recycling would be insufficient to meet the demand for new steel. The BOF has a complementary relationship with the EAF because it introduces new levels of steel into the total system. Second, the steel industry has never needed “recycled content” purchasing to drive scrap use. As a technological function of the steelmaking process itself, all steel contains recycled steel, creating an economic demand for scrap. And an extensive infrastructure has existed for decades to return all types of pre and post-consumer steel scrap to steel mills. After its useful product life, steel scrap is recycled back into another steel product regardless of the process from which it originated or is destined toward.